Mount Shasta reigns in icy solitude (11Jan2017). California has seen a massive series of storms come rolling through over the past 10 days or so. Much of the northern part of the state has been inundated with rain and snow. Here in Mount Shasta, we have had something of a split experience with both forms of precipitation. A week ago I posted on the first part of the storm, which dumped about 2 feet of snow at my house. After that post we had a couple of cold, sunny days to enjoy the newly fallen snow before the next storm moved in. Last Saturday was forecasted for up to 8 inches of snow. At my house (which is several hundred feet higher than Mount Shasta City) we had about a foot. A Narnia morning before the storm passes through. The sun rises before the snow starts falling. My truck shows off a nice snow load in our driveway. This turned out to be the high watermark of the storm. This snow, on top of what had previously fallen, left more snow on the ground than at any point since March of 2011, when we had a major (and much bigger) storm hit the area. I popped into town in the afternoon and though not as much snow had fallen there was still quite a bit on the ground. The snowy aftermath in town. An awesome snow sculpture in downtown. The following day (Sunday) the temperature went up and the snow turned to a heavy rain. The nicely groomed, fresh snow from the day before liquefied and turned into a nasty slush. What was a beautiful winter scene turned into a sloppy mess. With an enormous amount rain falling and the snow melting, I knew the creeks and rivers were going to be overflowing. I checked on the Shasta River to see how much water was in the channel and was quite impressed. I can’t remember the last time I saw the river this full. Monday brought about 4 or 5 more inches of now but the rain had melted off so much that it hardly seemed to help at this point. 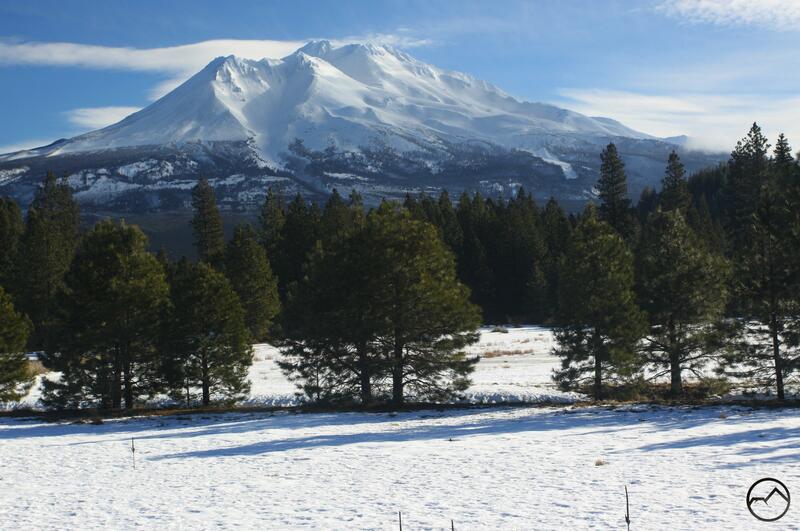 More rain followed on Tuesday before clear skies graced Mount Shasta on Wednesday morning. It was nice to see the sunshine again, as well as the mountains a glitter in their snowy blanket. Though it is snowing as I write this, sun is coming for the next several days before another storm comes through Mount Shasta next week. This winter is just getting started and it has already been a drought buster. Let’s hope for more yet more snow! Gorgeous Photos you have here Bubba! Love watching your journey! Snow totals east of the Sierra have been a little disappointing (it just won’t get cold! ), but the Sierra are certainly looking great, better than I’ve seen since we moved here. At least, the lower slopes look great; the peaks have been covered by clouds for days now. So nice finally to see some real winter! gorgeous! Wondered what the area looked like with snow. My friend lives in McCloud and he told me about his white Christmas.